Are you one of those people that finds decision-making easy? Did you follow the American elections of 2016 and did controlling the media seem fun to you? Yes? Then Headliner: NoviNews might just pique your interest. 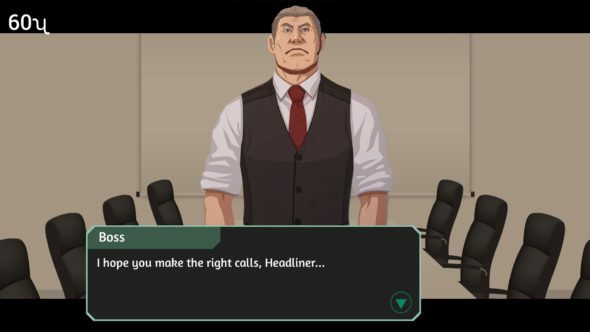 After releasing ‘Headliner’ last year, Unbound Creations is back with a new short media bias adventure where you get to control the national news. Of course, with a lot of power, comes a lot of responsibility. The public opinion rests in your hands, headliner. Welcome to Novistan, a city where you are the editor of NoviNews. You control national news, decide what gets published and what doesn’t. But beware, everything you do (or don’t do) will have consequences for yourself, your career, family, and society. Even though there isn’t a real backstory in this game, the information you get suffices for an enjoyable gameplay. And honestly, you’re making your own story along the way, making this a personalized adventure and unique experience. You won’t find the best 3D graphics in Headliner: NoviNews. It feels like some parts of the game could’ve used a little more polishing and detail. The people you talk to are drawn fine and look good. However, when looking at the characters walking the streets, it feels like not enough effort was put into them. People look too similar, not detailed enough, and just unfinished altogether. The same goes for your character and the streets packed with various buildings. These shortcomings have little effect on your gameplay, but do sometimes get a little annoying, certainly when you’re walking the streets. We do have to take into account that it’s a rather cheap game (9.99$ or €8.50) so we weren’t expecting the most high end graphics. Music is provided throughout the whole game. Whether it is upbeat music or a tune with a sad note, you’ll find it here. While most situations are provided with some fitting music, sometimes it’s nearly quiet, for example when you’re talking to your boss. Besides the soundtrack, there are also the in-game sound effects. You’ll not only see people talking on the streets by the use of speech bubbles, you’ll also hear whispers when someone is talking or a crowd when there is a protest or something. But it’s not only these kinds of things. It’s also the little things like hearing the rumbling of paper when you pick it up or the sound of a stamp when you accept or decline an article. 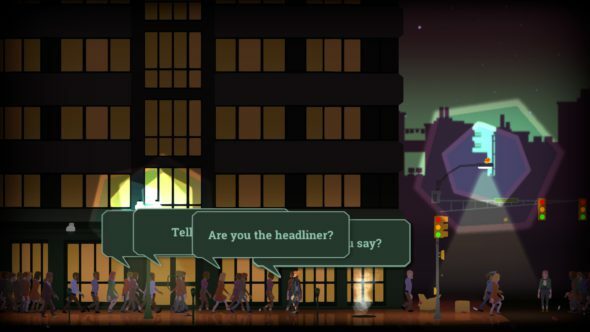 Headliner: NoviNews is a short media bias adventure. You get to decide what gets published in NoviNews and what doesn’t, which has consequences and creates unique stories. You play for a period of 14 days in-game. You start every day at the NoviNews headquarters. After having a talk with your boss and receiving your salary, you head to your desk and review the news of the day. You decide what will be published. You get two stamps; one to accept articles and one to decline them. Sometimes you’re free to accept or decline as many articles as you want, but sometimes your boss gives you a limit. For example, you’ll have to publish two articles or you can publish a maximum of three articles. You get three chances from your boss. If you hit three strikes, you’ll get fired. You may get strikes when you publish something that you’re not supposed to publish so think about what you do. At the end of the day, you walk home, passing certain buildings like the police office, the pub and stores and people. You’ll pass citizens talking about the news, so you can see how they feel about certain subjects. Every evening, there are different possibilities to talk to people or go places so you won’t always be able to go into the pub, or go to the store. Places you can visit and people you can interact with are indicated by hexagons you can click on. Once you’re home in your apartment, you can turn on your radio. This will also give an indication on how your headliners are perceived. Besides this, there’s little to do in your apartment in the beginning. You can choose to buy items in the shop, like a sofa, juke box or paintings, to brighten up and personalize your place a little. If you’re a dog person, you can let the stray dog follow you home and take it in. Don’t forget this means you’ll have to take care of your new pet and buy food. The way you react to situations, as well as the headliners you choose to publish, will have consequences for yourself, your career, family and society in general. Will you pursue the idea of free healthcare or increase the drug prices? Will you legalize recreational substances? Are you with or against the government? It’s all up to you! Different choices will create different situations and lead to various endings. The city reacts to how you take control of the media. 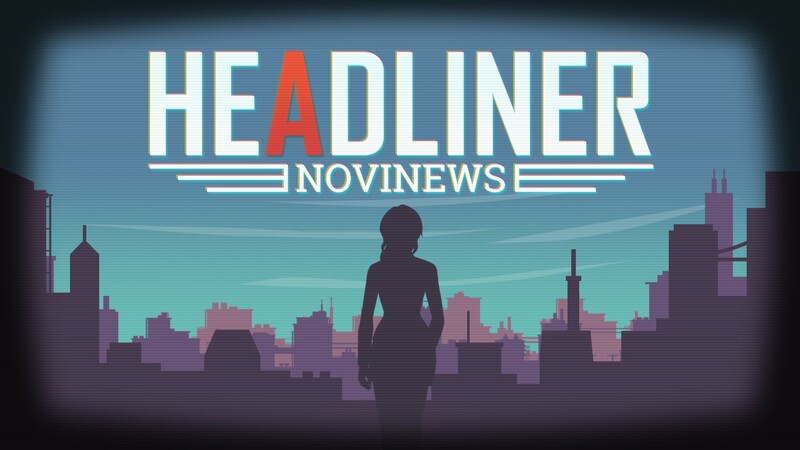 Headliner: NoviNews is a short game, only lasting around two hours. 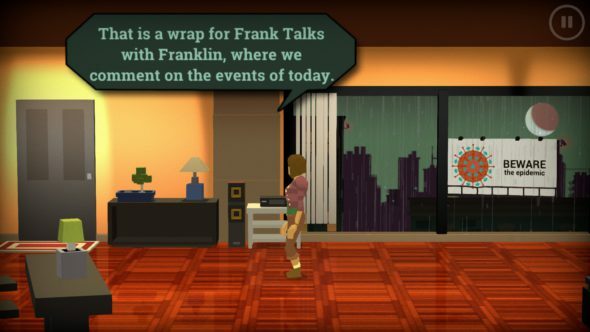 However, since there are so many choices to make, meaning there are plenty of outcomes, you can relive the game over and over again with different endings. What if you had listened to that stranger warning you? What if you hadn’t taken in your brother? Find out in another round and end with five headliners you can share with the world. Headliner: NoviNews is a fun game to fill up your empty Sunday and keep you busy for a few hours. Even though the graphics aren’t that great, the game keeps you interested since the city and situations respond to how you handle things. With a fixed period of 14 days in-game, you know exactly when you’re getting closer to the ending and can look forward to which five headliners you created this time. 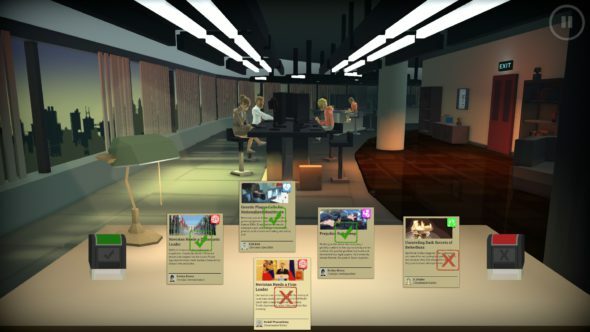 All in all, Headliner: NoviNews isn’t the greatest game you’ll find out there but it might just get you thinking about the news you read every day.